It pays to be seen on the big screen. 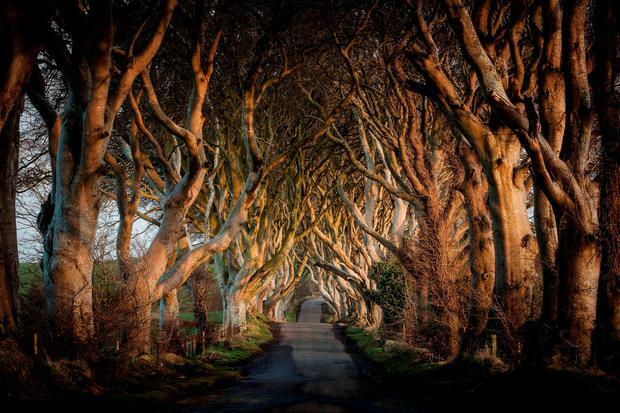 Game of Thrones, returning for its final season this Sunday, has made Northern Ireland a must-visit for fans from around the world - and it's not the only example. As explained on The Pat Kenny Show's (Newstalk, Mon-Fri 9am) travel slot with Irish Independent travel editor Pól Ó Conghaile, movie and TV sets are a "big driver" of visitors: according to Tourism Ireland, up to 35pc of them. This isn't always a good thing, he noted - for obvious conservation reasons you can't have too many people on Skellig Michael, regardless of how badly Star Wars fans might want to see it. But it's mostly good. Game of Thrones is worth millions to the North annually. A new attraction next year - a tour of Linen Mill Studios - "could rival" the UK's Harry Potter tour. As for Star Wars, Pól added: "We're seeing more and more of Ireland as the series develops: Dingle Peninsula, Loop Head, Malin Head". There's now a May the Fourth Festival every year, across these locations. Their chat touched on Father Ted (Plassey shipwreck, Burren, Aillwee Cave), the Cliffs of Moher (seen in Harry Potter), Line of Duty (filmed in Belfast) and Derry Girls. Finally Pat mentioned, "in a nod to Ivan Yates", Saving Private Ryan's Curracloe Beach in Co Wexford. The Grand National used to be a big thing back in the day; many of us will remember excitedly placing a few pence on the race each April, and some of us will even remember winning. The race doesn't seem to matter so much to the general public anymore, but this year's caused a kerfuffle: Tiger Roll became the first to win back-to-back Nationals since the legendary Red Rum in 1974. And of course, there were many Irish connections: the horse is Irish, as are winning jockey Davy Russell, trainer Gordon Elliott and owner Michael O'Leary. On Sunday with Miriam (Radio 1, 10am), Russell spoke of his feeling that he was "riding for the whole country". Interestingly, he also pointed out - we heard something similar on Off the Ball (Newstalk, Mon-Fri 7pm), too - that English people were hugely supportive of Tiger Roll, almost feeling his victory was theirs too. Who says Brexit has irreparably damaged Anglo-Irish relations? The Curious Cases of Rutherford and Fry (BBC Radio 4, Wed 9.30am) is one of those excellent pop-science shows Radio 4 does so well. They "investigate everyday mysteries" suggested by listeners: this week we had the Periodic Table, last week hypnotism. Previous subjects ranged from DNA testing, déjà vu and why bad food tastes so good, to an infinite universe and other dimensions. Both presenters are proper scientists, so you know that they know what they're talking about. If you have any curiosity about that "infinite universe", this is a great place to start exploring.